Manley’s modern take on the Pultec EQ with extra frequencies the original never had; a vastly superior power supply and famous Manley line amps complete the package. Magic on kick drum, killer on guitars. The MANLEY PULTEC EQP-1A, available in both single and 2-channel versions, uses 1 x 12AX7WA and 1 x 6414 (or 5965) in their ALL-TUBE single-ended line amplifier for the gain make-up and extra-beefy sound; gain is factory set for unity but additional gain is available by a rear mounted feedback adjustment trimpot. 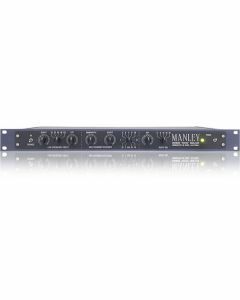 Like Manley's 40dB Mic Preamps, the Manley Pultecs offer both transformer coupled balanced and direct capacitor coupled unbalanced outputs for easy interface and sonic variety. Kick drum? Bring on the Pultecs and all the iron you can muster! You'll soon discover the power and magic of having those individual Low Frequency BOOST and CUT controls in that LF shelf circuit. . . Need a little clarity or extension? Try that middle bell-shaped Boost dialing in the sharpness of the boost on the BANDWIDTH control. Something bugging you? Ease it off with the HF shelf cut. You'll see. There's no substitute for a what a Manley Pultec EQ can do!